King George II – His early life. 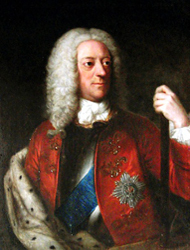 George was the only son of the Elector of Hanover, who later became King of Great Britain in 1714. Both his parents committed adultery when he was a young child and the marriage was dissolved in 1694 and his mother was confined to Ahlden House, Luneburg Heath in Lower Saxony, Germany. Both George and his younger sister Sophia Dorothea of Hanover, were unable to see their mother as she was dened access to them. Until the age of four, George only spoke French which was the language of the court and diplomacy. From then on he was taught German and then English and Italian. He also took a very keen interest in genealogy, military history and battle tactics. On the 22nd August 1705, he married Wilhelmina Caroline of Anspach, a very attractive woman, who later bore him eight children – Frederick, George, William, Anne, Amelia, Caroline, Mary and Louisa.